Accessories top off a room in a home. In fact, it can be said that the accessories make or break the beauty of a large room. The total ambiance is as important to the eye as the individual pieces of furniture in the room. In like manner, well-known chefs work as hard on "presentation" as they do on cooking food. To attract diners, the food must be more than delicious. It must also be "attractively displayed." All significant entities have to be made to reconcile with one another to create an attractive image. Otherwise, even the best of things remain odorless, colorless, shapeless, and bland. That which is most pleasing and effective bears the presentation mark of its chef, designer, or owner. The text for today points toward the challenge to make the church over into the likeness of God through the moral character of its members. Form is certainly important. The author recognizes the fact that because Christ loved us, he gave himself for us not only as an offering and a sacrifice, but so we could be to God a sweet-smelling fragrance. The image is one of Christians living together in such a way that they make an attractive presentation. This is pleasing to God. Since Christ loved us and gave himself for us, we Christians should live as Christ lived and love as Christ loved. Paul in Philippians also used the same expression, a "fragrant smell," to describe the self-giving love of Christians. It is the thesis of Paul in his letters and in those epistles, like Ephesians, written by his followers, that the death of Jesus had a grand purpose. Jesus died to bring all the discordant elements of humanity into one, to wipe out the separation and reconcile each of us with the rest of us and with God. This sweetness, this shape, is God's grand presentation. As such, belonging to God's church is not a mere walking down to become a member of an institution; not placing a signature on a commitment card.1 It is becoming part of a special arrangement which bears the mark of its designer. Like many today, the members of the early church had a genuine desire to be part of an institution that would help them be recognized by their neighbors as good people. Yet morals are difficult to learn and adopt. As Robin Lovin, Dean of Perkins School of Theology, has noted,2 most Christians do not realize how serious are the obstacles to developing morality within an institution. Experience does not serve us like it does when we learn avoidance of danger lessons through having hurt ourselves physically. We do not retain habits of morality the same way we maintain the skills required to play golf or ride a bicycle. Some force in life keeps drawing us away from the best we know and making it difficult for us to act on our beliefs even after we have understood what they require. Turning from self to God is always a difficult task in any age. Living with others in a community called "church" makes it an especially difficult task. The letter to the Ephesians is written to those who live "face-to-face" with one another in a household church. We, too, find such face-to-face relationships fraught with anger, insensitivity, white lies, and gossip. Malice runs rampant in every age. It is not easy to be forgiving and kind in our kind of world. We all need space, and it is becoming harder to find. Our grandparents had lots of room. Agriculture was the primary method by which people earned a living. They could do pretty well as they pleased on their property. They did not even have to lock the doors. When you got mad on the family farm, your mother just ran you outside to walk through the tobacco or corn fields until you cooled off. You didn't have to worry about being hit by a car or having someone try to kidnap you or sell drugs to you. Then, when you had cooled off, grandparents, parents, cousins, aunts and uncles, living in fairly close proximity, gave you a wide area over which to spread your feelings. Our world is a lot more close-up. We live house to house, apartment to apartment, townhouse to townhouse, room to room, suite to suite. We drive fender to fender. We work elbow to elbow. We often get in each other's way. And when we try to spread out our feelings, we often find that the larger family is no longer there to absorb them. We have to focus our anger on fewer people. It naturally becomes more intense. Living close-up has problems. We all love and hate the very people with whom we are the closest. The two feelings exist side-by-side.3 Seventy percent of the people admitted to emergency rooms in hospitals on Saturday nights are victims of either domestic violence or violence among friends. All of us compete with one another for honors and recognition, and if we do not get them we become angry. We compete for power, and if we do not acquire it, more anger is generated. Fathers and sons compete with one another, and daughters and mothers compete with each other. We live in a competitive democracy. We are living amid what one national newspaper has called "a new epidemic of anger." Shoppers get into fistfights over who should be first in a newly opened checkout line in a supermarket. A Massachusetts father has actually beaten to death another father in an argument at their sons' hockey practice. Bad tempers are on display everywhere. "Rage is the rage today," says C. Leslie Chambers in an article by Karen Peterson in USA Today (18 July 2000). The same article reports that 78 percent of Americans believe rude and selfish behavior has increased at highways and airports. High-tech devices like pagers, cellphones, and other devices fracture our days and fragment what little time we have to live life. We constantly have to "multi-task" and are overloaded with a sense of urgency. Perhaps today's text comes at a good time in the life of our church. Ordinary Time can become the best and worst of times in the life of the church. The "image" days of Christmas and Easter are long gone. In these "ordinary" days when we wrestle with summer slump, people moving in and out of the fellowship, and heightened concern over the adequacy of church finances, being church can produce a rancid smell instead of a sweet fragrance. Put away every form of malice. Such "putting away" of harmful aspects in social relationships reflects the mark of ownership of the Spirit of God. If we were lost in Adam but regained in Christ as the New Adam, we must represent the character of the New Adam. An old story illustrates the effect that anger can have on the way we present ourselves to the world around us. There once was a boy who had a bad temper. His father gave him a bag of nails and told him that every time he lost his temper, he must hammer a nail into the back of the fence in the yard. The first day the child had driven 37 nails into the fence. Over the next several weeks, the number of nails gradually dwindled down as he began to learn to control his temper. The day finally came when he didn't lose his temper at all. He had learned that it was easier to hold his temper than have to drive nails into the fence. He told his father about his success. The father suggested that the boy now pull out a nail for each day that he was able to hold his temper. The day finally came when he was able to tell his father that all the nails were gone. The father led the boy out to the fence. He said, "You have done well. But look at the holes left in the fence. It will never be the same. When you do things in anger, they leave scars just like these. Regardless of how many times you say you are sorry, little wounds are still there." Indeed, verbal wounds can be as bad as physical ones. We Christians cannot hold forth to the world images of noisy impertinence, elbowing self-conceit, bitterness, and anger. We must hold forth the graceful mood of God our creator and properly present that creator to those who labor with us, both within and without. The Biblical narrative clearly tries to close various loopholes that shackle Christians in every age. Whoever wrote this text to the Ephesians was not concerned with being nice. The writer was concerned to give us a clear focus on the call to Christian living. The fragrance that emanates from the lives of Christians as they live and work together in the church is as pleasing to God as are fumes which rise heavenward from the altar of worship. Regardless of its physical beauty, a church "shows" better when it is furnished with Christians who are compassionate toward one another. The aura and smells of the church are important to its potential members. How we relate to one another is one of the ways we present God to the world. Sometimes presentation is everything. 1. K. David Cole develops the faith journey in an incisive sermon, "Through This Portal," in Out of Mighty Waters: Sermons by African-American Disciples (St. Louis: Chalice Press, 1994), pp. 173-177. 2. Robin Lovin, Christian Ethics: An Essential Guide (Nashville: Abingdon Press, 2000), especially pp. 74-75. 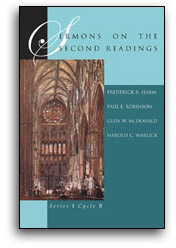 This well-written work should be read by any preacher seeking to preach on the moral teachings of Christianity in general and the scriptures in particular. Lovin writes with a style that both edifies and inspires. 3. Leo Madow, Anger: How to Recognize and Cope With It (New York: Charles Scribner's Sons, 1972), p. 20. 4. Joseph A. Fitzmyer, S.J., Paul and His Theology (Englewood Cliffs, New Jersey: Prentice-Hall, 1989), p. 101.